Julia Louis-Dreyfus broke the record last night and took home another Emmy Award in a strapless Carolina Herrera gown with yellow floral applique. Julie Bowen wore a side ruffled Alberta Ferretti gown. Claire Foy wore a one-shoulder Oscar de la Renta jumpsuit with a silver knotted rope decoration. Mandy Moore posed in a tiered black and white Carolina Herrera gown. Kate McKinnon took home her Emmy in a Narcisso Rodriguez gown. Priyanka Chopra wore a long-sleeved embellished Balmain gown and white feather bottom. Tracee Ellis Ross was all smiles in a balloon-sleeved silver Chanel gown with a white feather bottom. Shailene Woodley showed off her toned arms in a plunging dark emerald Ralph Lauren velvet gown. Gugu Mbatha-Raw posed in a strapless yellow-green Boss side-slit dress. Natalia Dyer wore a sleeveless lime green Vera Wang gown. Zoe Kravitz looked pretty in a plunging Dior Haute Couture feather gown. 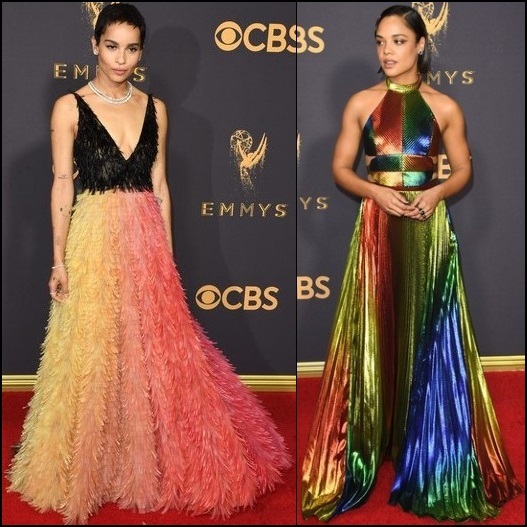 Tessa Thompson showed off her arms in a multi-colored Rosie Assoulin halter gown. Nicole Kidman looked beautiful taking home an Emmy in a red Calvin Klein by Appointment gown. 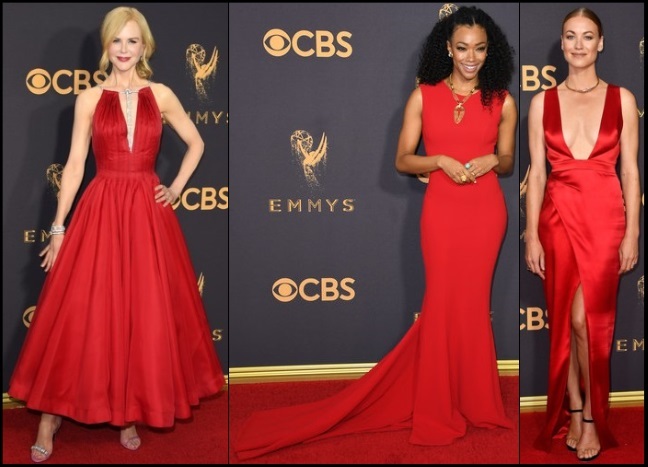 Sonequa Martin-Green wore a sleeveless red Romona Keveza gown. Yvonne Strahovski wore a plunging sleeveless Julien Macdonald dress. Sarah Paulson shimmered in a Carolina Herrera gown with exaggerated shoulders. Anna Chlumsky shined in a plunging Sachin & Babi gown. Sofia Vergara posed in a Mark Zunino mermaid gown. Evan Rachel Wood wore a Jeremy Scott for Moschino menswear inspired ensemble. Halston Sage perked up the red carpet in a Zac Posen dress. Samantha Bee wore a plunging emerald green Rubin Singer slit dress. Amanda Crew wore a shimmering long-sleeved Michael Cinco ombre gown. Keri Russell posed in a black lace and feather J. Mendel gown.